(MP173). W M Birchall (American; b.1884). Watercolour signed and dated (LL) 1910. Standard size: 12 x 8.5 inches (30.5 x 22 cms) approx (although enlarges very satisfactorily). In April 1909 the three ships (the last to enter service was INVINCIBLE in March of that year) were formed into the 1st Cruiser Squadron under Rear Admiral The Hon Stanley Colville CB CVO. His flagship was HMS INDOMITABLE (Captain Charles de Bartolome RN) and she is easily identifiable here in the foreground as she is wearing Admiral Colville’s flag at the fore. Astern of her is either HMS INVINCIBLE (Captain Mark Kerr MVO RN) or HMS INFLEXIBLE (Captain Charles Napier RN); and amongst the dense clouds of coal smoke in the background is a flurry or two of escorts - light cruisers and torpedo boat destroyers. Guarding the Strait of Gibraltar as ever, is the Rock, headquarters of Admiral Superintendent Gibraltar, Rear Admiral Frederick Pelham in his flagship HMS CORMORANT. William Minshall Birchall was born in Iowa, America, in 1884 where he made a name as an illustrator and portrait artist before emigrating to England: here he settled on the south coast at Hastings. He has 5 watercolours hanging in the National Maritime Museum, Greenwich and a further 7 in the Peabody Museum, Salem. 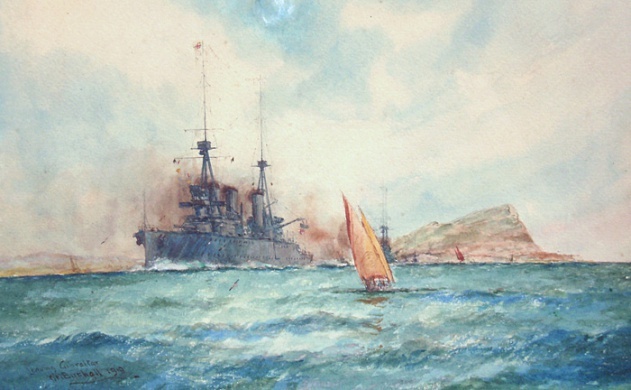 He invariably manages to add an atmosphere to his watercolours, this one being no exception as he portrays these huge, ultra modern leviathans surrounded by their fussing escorts storming their way out of harbour, whilst the crew of the saffron sailed tartane in the foreground can only wonder what exactly is roaring past them with so much noise and such self importance! ALL IMAGES ARE IN COPYRIGHT. Every image on this website is protected by either Artist’s Copyright or Maritime Prints’ Publication Right. Whilst no image may therefore be reproduced without authorisation from Maritime Prints (who in turn will often have to apply for that permission from the artist or artist’s estate) every effort will be made to accommodate requests if they are for other websites wishing to promote these images.